April is the Month of the Military Child, a month in which we celebrate the children of the members of the Armed Forces. Some of these children only spend a few years as a military child, while others don't know any other way of living. From moving every few years to living without mom or dad for months at a time to trying to figure out what having a parent who serves really means, military kids need the support of their communities. What’s the best way for a community to show they care about military kids? Here are a few ideas. 1) Plan a fun event. 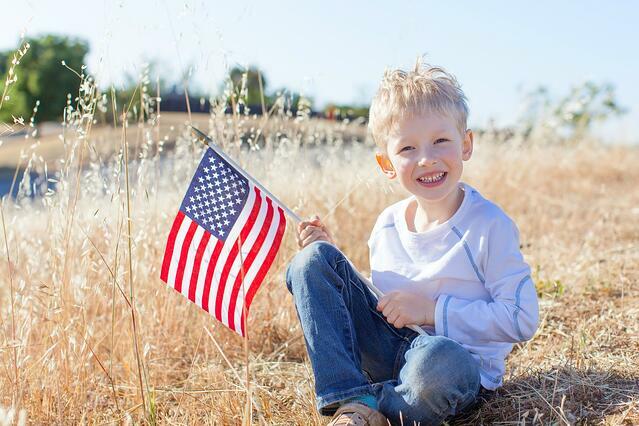 As a community, an event can be planned for honoring military kids. This event can be a time for everyone to come out and celebrate the Month of the Military Child together. Offer fun games, good food, and a friendly atmosphere for military families and military kids to be celebrated. Whenever you see a military family or military kids out in your community, smile! Let them know they are welcomed and that you enjoy seeing them. Kids can tell when they are not wanted, and by including them in your community they can feel more loved and appreciated as they live their military lives. A creative way to celebrate military kids in the community would be to have an event at the library about all the books out there written for military kids. This can be a good way to bring the community together and help others understand more about military life. Plan book readings and other fun activities for the kids. Communities can celebrate military kids by having a parade. Encourage the children to dress up and be a part of the festivities. This can be a lot of fun and help foster relationships between military families and their communities. Most kids love to be a part of something like a parade, and having one can be a great way to honor them as well. Posters and other information about the Month of the Military Child can also be a good idea. That way, the community knows what is going on and will be able to be a part of this celebration. Most Americans appreciate what military kids have given up and what their lives have been like because they have a mom or dad in the military. Having a community work to celebrate them helps the children feel welcomed in the city and town they are currently living. Knowing you are appreciated is a good thing for the kids and a great way for a community to say thank you to the military families that live in their area. Julie is a blogger & social media addict living in Tennessee. She has been married for 13 years to her National Guard Soldier and has three boys aged 11, 9, and 5. You can find her at Soldier’s Wife, Crazy Life where she blogs about military life. You can also find her on Twitter and Facebook.